Well, not live but I'm still reading and haven't finished it yet. 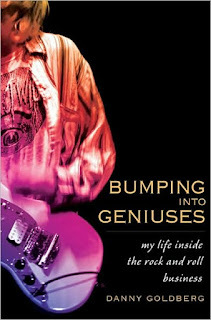 Bumping Into Geniuses: My Life Inside the Rock and Roll Business. Danny Goldberg. Gotham. 320 pages. Just started it a few days ago. Nothing special so far. Goldberg is a longtime artist manager and label exec. Met him back in the day when I was the A&M Florida promo guy and we distributed his Gold Mountain label. They'd just signed Timmy Thomas and we did a retailer thing on a boat in Biscayne Bay. Anyway, I just got to the part in the beginning of the book where he was a rock critic and was hired by Michael Lang of Woodstock fame to do PR for artist Karen Dalton. Goldberg sent out a bunch of albums to his writer friends but none of 'em "got it," he said. So he wrote a review of her album which was published in Rolling Stone. A little conflict of interest maybe? Breech of ethics?